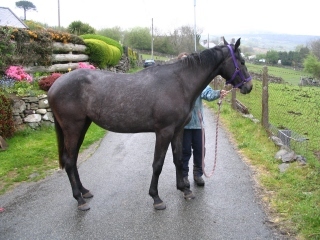 Thoroughbred/Oldenburgh cross mare, aged 2 at start of case study. After that initial setup trim, the mare unfortunately passed out of the EP’s care. She was not trimmed regularly and the advice given on managing her environment was not followed. The case wasn’t seen again until seven months later when the current owner bought her and asked the same EP to take her on. 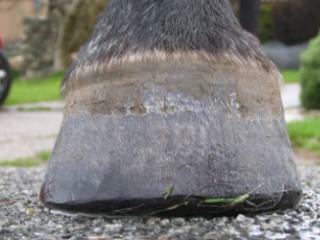 The original trim had had some positive effects in correcting the shift to the left fore hoof capsule, but the mare had in the meantime suffered three separate hoof abscesses between the front feet because she had been kept/worked on hard ground that such poor quality hooves just weren’t ready to take. 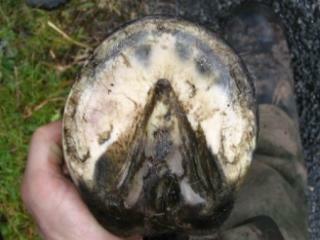 It took 5 more months of regular trimming and careful management of the horse’s environment to fix the worst of the problems. 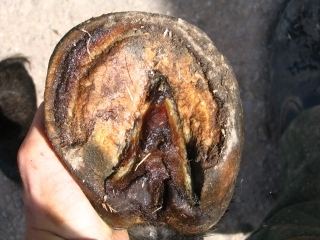 The original cause of the hoof deformity is not known, but there was no obvious reason why the hoof should have continued to be in a poor shape other than neglect. The mare is now fully sound and is being brought into work. 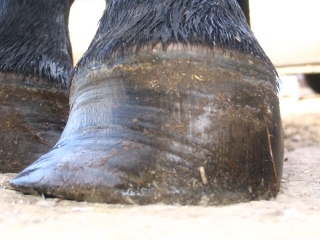 The overall quality of the feet is improving steadily and the hooves are now at the stage that would be expected of a horse of this age and at this stage in training. There has been no further abscessing since the mare came back under the care of an EP.